What complications can develop from diabetes? Atherosclerosis is hardening of the arteries caused by a build up of fatty deposits, causing the arteries to become blocked. There may be no obvious symptoms and so can lead to potentially life threatening conditions such as a heart attack or stroke. 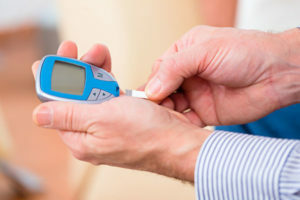 People with both type 1 and 2 diabetes are both at risk. What causes atherosclerosis in people with diabetes? High levels of glucose in the blood can damage the wall of the arteries and so fatty deposits are more likely to form and block the arteries. This is why it is so important to manage your glucose levels. How can I avoid atherosclerosis? You can reduce your risk of atherosclerosis if you keep your diabetes under control and stick to a healthy balanced diet with plenty of exercise. If your doctor or diabetes team think you might be at risk of atherosclerosis then they will recommend you have your cholesterol and blood pressure monitored more regularly. Diagnosis is usually due to your symptoms, such as angina and any risk factors you may have such as high cholesterol and high blood pressure. Your doctor may also recommend a ECG heart scan, CT scan or MRI scan. Treatment for atherosclerosis may just involve lifestyle changes like quitting smoking, healthy diet, regular exercise. You may also be prescribed medication such as statins to help lower cholesterol. If arteries are blocked angioplasty or surgery maybe required. For more detailed information on heart disease and strokes click here. If you have diabetes it is very important that you have regular eye examinations at least once a year. A common complication of diabetes is damage to the retina at the back of the eye. If left untreated vision can be affected and in severe cases cause complete vision loss. The retina needs a constant supply of blood, which it receives through tiny blood vessels, constant high glucose levels causes damage to the tiny vessels in the retina. Like most diabetes complications you are more likely to develop eye problems if glucose levels are not kept under control. What symptoms are there of diabetic eye problems? Not everyone will have any obvious symptoms but early symptoms you might experience are floaters or flashes, eye pain, sudden vision loss or worsening vision. If you experience any of these then you should visit your doctor or diabetes team immediately. How are diabetic eye problems diagnosed? If you have regular eye examinations, any changes to the eye should be picked up. Further tests may then be carried out to examine your eyes properly. You might have drops that are put in the eyes to make the pupil as wide as possible. Another possible test is a fluorsescein angiogram this involves a special dye injected into a vein which travels to the eye. A special camera is then used to examine the eye, this will show up any swollen or abnormal blood vessels. What treatment is available for diabetic retinopathy? If your condition is mild you may not require any treatment other than keeping glucose levels under control and monitoring blood pressure. However, if the eye problems are more serious you may require laser treatment this involves a very bright light that makes burns on whatever it is focused on, a burn can seal leaks from blood vessels and stop new ones from growing. Laser treatment won’t work if vision is already lost. Various eye operations may be required if you have a bleed or develop a detached retina. Diabetic kidney disease, commonly called diabetic nephropathy is a complication of diabetes, it usually develops over many years but if left untreated it can cause kidney failure. Around 40% of people with diabetes will develop it. What causes diabetic kidney disease? Diabetic kidney disease is caused when raised glucose levels cause the small blood vessels in the kidney to become blocked and leaky as a result they don’t clean the blood as they should. This causes the kidneys to leak proteins from the blood into the urine, the main protein that is leaked into the urine is called albumin. What are the symptoms of diabetic kidney disease? Puffy eyes, swollen ankles, hands or lower legs caused by water retention. To prevent kidney disease reaching later stages, regular urine tests to check for the presence of the protein albumin is very important. How is diabetic kidney disease diagnosed? A routine urine test usually detects the disease if it finds raised levels of albumin. If you have diabetes you should do regular urine tests. 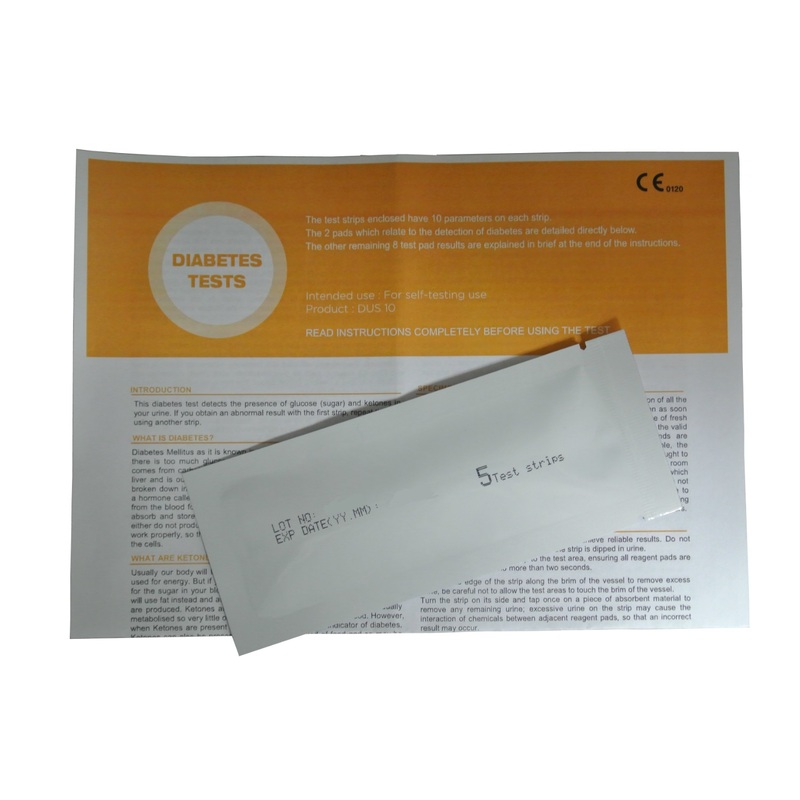 We sell a range of diabetic urine tests, click here to find out more. A blood test may also be carried out to see how well the kidneys are working. Am I at risk of diabetic kidney disease? Again you are more at risk of developing any complication if your blood glucose levels are not kept under control. You are also more likely to develop the disease if you are overweight, you have high blood pressure and if you are male. How is diabetic kidney disease treated? Your aim at treating kidney disease is to manage your blood glucose levels and blood pressure. There are several types of medication available which can help lower blood pressure and help reduce the loss of protein. However, if kidney damage becomes severe then you may require dialysis or even a kidney transplant. Diabetic neuropathy is nerve damage that can affect people with diabetes. Diabetic neuropathy can develop over time as increased high levels of glucose in the blood can cause damage to the nerves. When the nerves become damaged they can no longer effectively carry messages around the body. This could mean that if you had a cut on your foot you may not feel it and this could then develop into an ulcer. Sensory neuropathy : as the name suggests this affects the nerves that detect touch, pain and temperature. Motor neuropathy : this affects the nerves that control muscle movement. Autonomic neuropathy : this affects the nerves that control your bodily functions such as heart rate, digestion, blood pressure or bladder and sexual function. Burning or stabbing pain in the affected area. Neuropathy is usually diagnosed based on your symptoms and a physical exam. Your doctor will check your glucose levels, blood pressure, heart rate and then check your muscle strength, reflex and your ability to move. Your doctor will ask if you have any sores that are not healing then might refer you to a specialist. Treatment will depend on the severity and which nerves are affected. Treatment might just consist of lowering high glucose levels and better diabetes management. Medication for nerve pain might be prescribed. Untreated neuropathy can put you at risk of infections due to cuts or sores that don’t heal so ensure you always examine your body to look for sores that are not healing. Diabetic ketoacidosis or DKA for short is a potentially life threatening condition that occurs when the body runs out of insulin. Diabetic ketoacidosis is caused when your body doesn’t have enough insulin so is unable to use glucose for energy. As a result the body starts to burn fat for energy in replacement and as fat is broken down ketones are released into the blood. Managing your diabetes and regularly checking glucose levels can reduce your chances of it developing. Take better care of your diabetes management when ill or if you are having surgery. You are more likely to develop diabetic ketoacidosis if you take illegal drugs. binge drink and for women on their period or during pregnancy. What are the symptoms of diabetic ketoacidosis? Needing to pass urine more frequently. If you suspect you may have DKA you should seek medical attention immediately. How is diabetic ketoacidosis diagnosed? You should be able to diagnose it yourself with a home test to detect ketones in the urine. If you have high levels then you should seek urgent medical attention immediately. A doctor will diagnose ketoacidosis with either a urine or blood test. You can purchase a ketone test on this website, click here for more information or to purchase. When you have diabetes you should always do glucose checks and a urine test to check your levels whenever you feel unwell. How is diabetic ketoacidosis treated? Treatment usually involves giving insulin usually straight into the vein. You will usually also be given salts and fluids to re-hydrate the body. The doctors will closely monitor you to ensure no life threatening conditions develop. When you have diabetes it is important to take care of your feet as diabetes can cause a reduced sensation of the skin on your feet. The arteries in the legs can become narrowed also, resulting in poor circulation of blood to the feet. If the blood supply is reduced then skin does not heal as well, foot ulcers can develop which are then prone to infection then if untreated can lead to amputation. How can I avoid foot problems? To prevent problems with your feet it is important that you control your blood glucose levels. You should also take care of your feet, keep diabetes under control and get a check up at least once a year. You should wash your feet regularly and dry them carefully then use a moisturiser to prevent cracked skin. While doing this each day keep an eye on your feet, including between the toes so any problems can be picked up early. If you notice anything new like cuts, bruises or blisters then you should see a podiatrist. Avoid walking barefoot to minimise the risk of treading on something and cutting the skin. Ensure your shoes and socks fit properly so that blisters, corns or calluses don’t develop. How can I treat foot problems? Though foot ulcers can be painful they are usually easily treated. If you have a problem with your feet you should see your doctor or podiatrist for help. The doctor will usually apply a dressing that will need to be cleaned and re-dressed regularly. If nearby tissue looks infected then antibiotics may be prescribed. If the arteries in the leg have become very narrowed then an operation to widen them may be required.